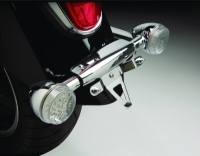 This bracket relocates the Kawasaki VN2000 license plate to under the rear turn signals for a clean and custom look. 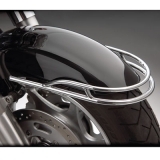 Required for mounting Sissy Bar Luggage Rack (55-322) to Sissy Bar Kit (71-130). 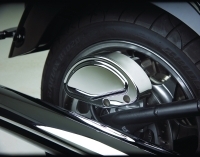 This bright chrome Free Spirit Air Cleaner Cover is made of chromed ABS and replaces the OEM cover. 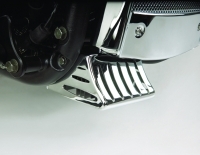 A chromed steel cover for the rear brake caliper. Created in the popular raised chrome design. Mounts with hardware included, no drilling required. Chromed ABS Arm covers the vertical swing arm.